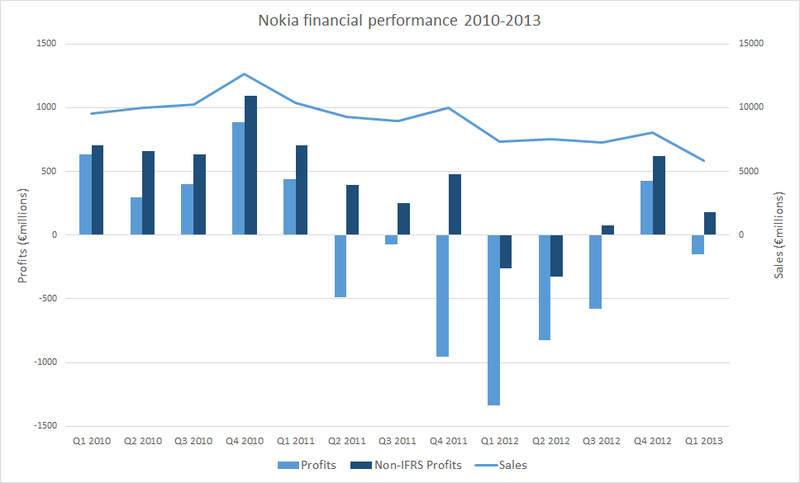 Nokia has released its Q1 2013 results, reporting an operating loss of €150 million (up from a loss of €1338 million in Q1 2012), with net sales of €5.852 billion (down 20% year-on-year). Nokia's Devices and Services division's operating profit was -€42 million. The margin in Devices and Services was -1.5% (up from from -5.1% in Q1 2012). Total smartphone device sales were 6.1 million (5.6 million Lumia, 0.5 million Symbian), but mobile phone volumes fell to 55.8 million, down 21% year-on-year. Nokia's non-IFRS figures (a measure of underlying performance) show a higher profit (€186 million) than the standard figures, due to one off charges around restructuring (-€255 million), asset amortization, and other factors. The underlying profit for the Devices & Services division (€4 million) is also positive for the second quarter in a row. The non-IFRS margin for Devices & Services was 0.1% (up from -3.0% in Q1 2012, but down from 1% in Q4 2012). As a result of the improved performance, Nokia improved its cash position by €120 million, with the net cash figure now €4.5 billion. Of this amount €220 million was from Nokia Siemens Network, indicating the Devices & Service division was a cash drain. Nonetheless, the improvement in the net cash position will be seen as a sign that the company is in a much stronger financial position than a year ago. The results, which were slightly ahead of Nokia's own projected weaker outlook for Q1 2013, were below analyst expectations in terms of sales (€6.48 billion versus €5.85 billion), on par in terms of smart device unit sales (5.6 million Lumia devices), and ahead in terms of profitability (-€0.25 EPS versus -€0.07 EPS) and net cash position (€3.7 billion versus €4.5 billion). However, primarily due to the weaker than expected mobile device volumes, Nokia share price is trading down 10%. The headline figures for Nokia are generally positive, given Nokia's recent history, with a firm pattern of underlying profitability and growing Lumia device sales now established. What is most apparent is that the figures, across the board, have improved dramatically from a year ago. However, in the context of the wider industry, the figures remain relatively weak, and Nokia has a long road ahead as it seeks to grow its smart device (Lumia) volumes. Nonetheless, it seems clear that it will have the opportunity to do so, something that was an open question a year ago. The caveat remains that the company is now operating in the context of lower device volumes, especially in high-end smartphones, compared to previous years (i.e. Nokia is operating at a reduced scale in terms of device sales, and is no longer as dominant in the industry as it once was). The sharp decline in mobile device volume is a cause for concern; although a gradual decline in mobile phone volumes is probably unavoidable, a 21% decline over last year's sales is faster than expected. "At the highest level, we are pleased that Nokia Group achieved underlying operating profitability for the third quarter in a row. While operating in a highly competitive environment, Nokia is executing our strategy with urgency and managing our costs very well. We have areas where we are making progress, and areas where we are further increasing the focus. For example, people are responding positively to the Lumia portfolio, and our volumes are increasing quarter over quarter. Nokia Siemens Networks delivered another strong quarter and contributed to an overall improvement in Nokia Group's cash position. On the other hand, our Mobile Phones business faces a difficult competitive environment, and we are taking tactical actions and bringing new innovation to market to address our challenges. All of these efforts are aimed at improving our financial performance and delivering more value to our shareholders." Of the smart devices volume of 6.1 million, 5.6 million were Nokia Lumia devices and approximately 0.5 million were Symbian devices. 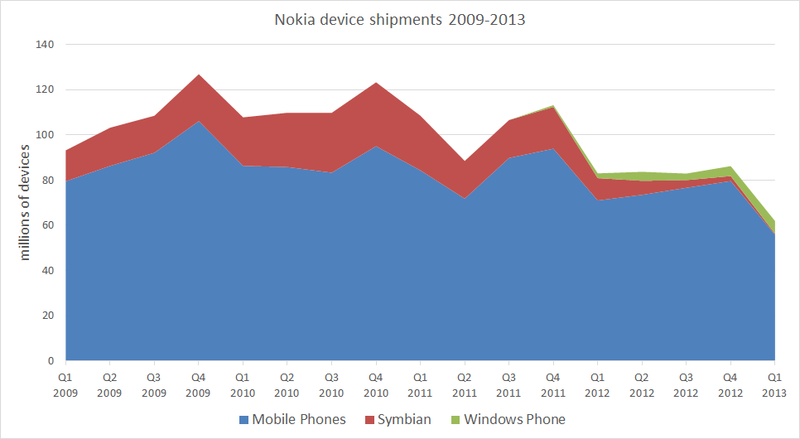 This compares to 4.4 million Windows Phone and 2.2 million Symbian devices in the previous quarter. This was the first quarter in which Lumia (Windows Phone) devices exceeded 5 million units and the first quarter in more than 10 years in which Nokia sold less than a million Symbian devices. The average selling price (ASP) for smart devices was €191 (up 34% from €143 in Q1 2012 and up 3% from €186 in Q4 2012), reflecting an increased proportion of higher cost devices (principally, the Nokia Lumia 920 and 820). 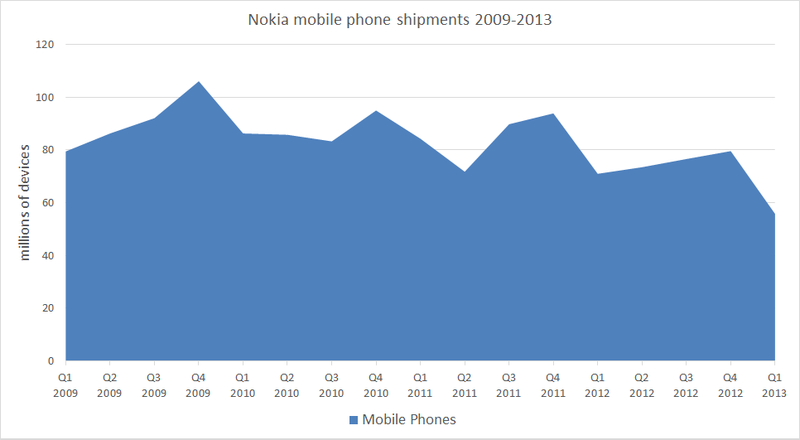 Nokia's Mobile Phone volume was 55.8 million, down 21% from 70.8 million in Q1 2012, and down 30% from 79.6 million in Q4 2012. ASP for Mobile Phones was €47, down from €51 in Q1 2012, but up from €45 in Q3 2012. Despite poorer than expected sales, Nokia's Mobile Phone products continue to drive the profitability of the Devices & Services division. For the Devices & Services division as a whole, Smart Devices has a -16.2% contribution margin, compared to a +5.5% contribution margin for Mobile Phones. This is, in large part, due to the relatively low volumes of Smart Devices, as also indicated by the relatively strong gross margin figures (20.7%), against the operating expenses (€420 million) for Smart Devices. However, the picture is improving, with Smart Devices contributions up from -18.3% a year ago and -21.6% last quarter. If Nokia is able to continue to grow Lumia devices sales then Smart Devices should move nearer to having a positive contribution margin. In terms of the geographic breakdown of sales, shipment volumes and sales declined, compared to a year ago, in all regions, reflecting the decrease in mobile phone sales year-on-year. Notable was the year on year decrease in China (9.2 million units down to 3.2 million units), suggesting Nokia still has work to do in the world's biggest mobile device market. Combining Windows Phone, Symbian and Asha device sales gives a total smartphone volume of 11.1 million units. This compares with 11.9 million units in Q4 2011 (down 6% YoY) and 15.9 million units in Q4 2012 (down 30%, QoQ). 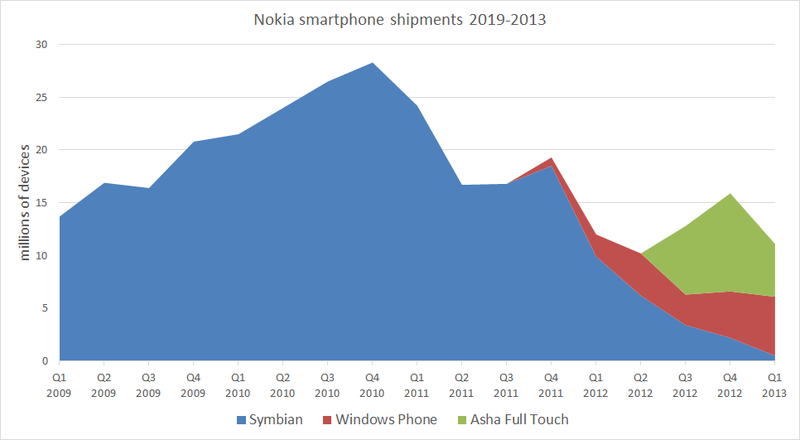 The main reason for the quarterly decline was a fall in Asha full touch sales (down 46%) and a decline in Symbian sales (down 66%). Nokia's HERE (Location & Commerce) division reported sales of €216 million, down from €277 million in Q1 2012 and down from €278 million in Q4 2012. 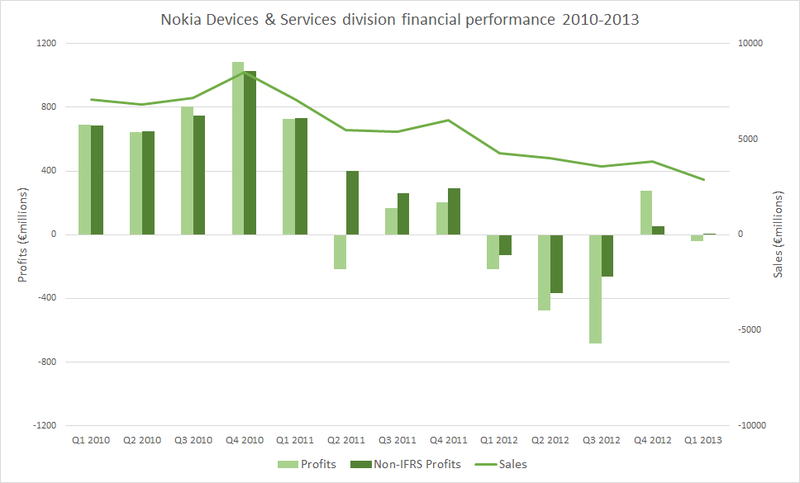 The decrease was mainly due to lower internal sales (due to lower sales volumes of Nokia devices). Nokia Siemens Networks reported sales of €2.804 billion, down from €2.947 billion in Q1 2012 and down from €3.988 billion in Q4 2012. Operating profit was €3 million, up from -€1.004 billion in Q1 2012, and down from €252 million in Q4 2012. Looking ahead, Nokia expects to see a similar Devices & Services margin in Q2 2013 to -2% (+/- 4%), reflecting competitive dynamics, changes in device demand, and the macroeconomic environment. 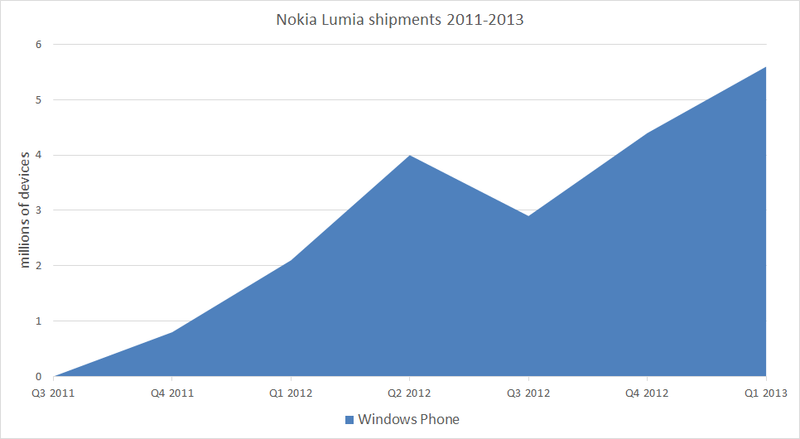 Nokia expects the sequential growth in Lumia units to be higher than the the 27% growth from Q4 2012 to Q1 2013, suggesting Lumia device volumes of at least 7.1 million units in Q2 2013. As with Q1 2013, the Location & Commerce division's operating margin is expected to decline due to lower internal sales, mainly due to decreased deferred revenue from lower smartphone sales in 2012 (i.e lower Symbian sales in 2012).